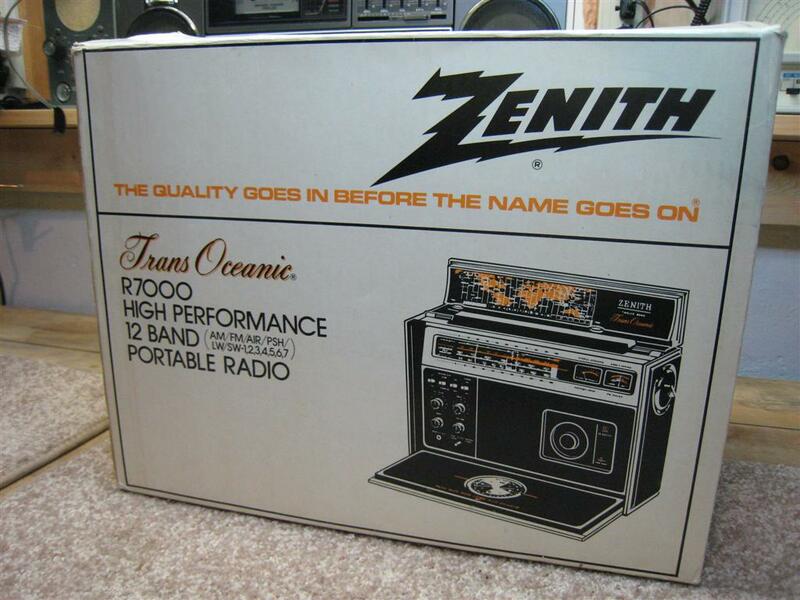 The Zenith Trans-oceanics are among the most iconic of all portable multi-band radios ever produced here in the United States. From the original 7G605 Clipper introduced in 1942 through the R-7000 series sold between 1979-1981 they were not only a luxury item, they also were a status symbol, and represented an appreciation of the finer things. Yet the R-7000 series was a radical departure from some of the design concepts upon which all the previous models were based. For this reason many Trans-oceanic fans disparage the final T/O as being inferior to the ones that went before, but interestingly, since they were sold in such small numbers compared with earlier models, they demand premium prices in today’s collector market. I’ve been astonished to see boxed examples sell for over $2000 over the past several years, and in just the past year or two I have seen several R-7000’s in their boxes reach $3000 to $5000 which is truly amazing. But even without their boxes (which usually greatly increases the price any used radio will bring), the last of the Trans-oceanics still sell for well above the typical price of the previous model, the Royal 7000 series. There is also considerable model number confusion because of the similar names of these last two series…Royal 7000 vs. R-7000. Why Zenith chose to do that is anyone’s guess. I also refer to these as series because there are variants among them…three different Royal 7000’s and three R-7000’s. Confused yet? Fear not…I’ll describe the versions of the R-7000 as we go along. (Also see my restoration article on a Royal 7000 here). DESCRIPTION: The R-7000 is externally nearly identical to the previous Royal 7000…the case appears to be pretty much the same other than a few superficial styling differences. 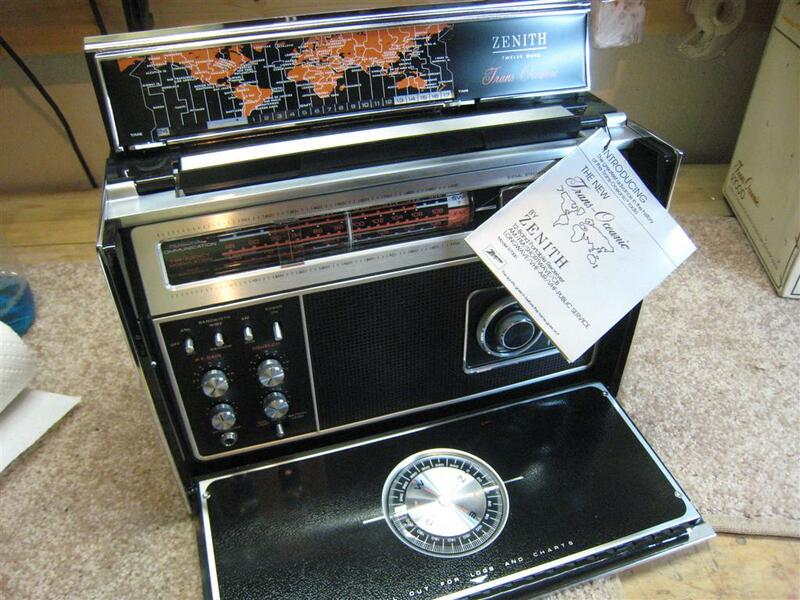 But once you open the front doors you see a completely redesigned radio. The black, silver and light blue of the older model is replaced by predominantly black with a bit of silver and reddish orange accent colors. Size is 13.8 x 10.2 x 6.2”. Control functions are similar with the rotating dial drum revealing the different bands and the big band change knob on the right hand side. It is powered by 8 D cells or the built-in AC power supply and the same large 57” whip antenna folds down into the top rear of the cabinet. The R-7000 has a built-in BFO for Single Sideband (SSB) reception, squelch for PSB and AIR bands, variable RF gain, two IF bandwidths for all AM/SW modes, concentric coarse and fine tuning knobs and dial illumination which is controlled by the usual momentary switch when running on battery power…illumination is full time when running on AC. But as you go higher in frequencies the Royal’s band spread provides separate band spreads for 31, 25, 19, 16 and 13 meters whereas the R-7000 gives you four general coverage bands. Even more interestingly the R-7000 does feature one spread band; SW 7 covers 26.9 – 27.5 MHz, which is a small segment of the SW 6 band which spans 22 – 30 MHz. Why a spread band at this odd frequency range? The answer is Citizens Band which was hugely popular back in the 70’s and 80’s. Internally the R-7000 is a completely different beast than all previous ZTO’s, using all new technology for its day, replacing the hand-wired chassis and plug-in transistors with a modern printed circuit board and IC’s. But there was an even bigger change which signaled a clear break from the “spread band” concept of all previous Trans-oceanics. This is the single biggest point which many dyed-in-the-wool Zenith fans were disappointed with. As well-explained by Bryant and Cones in their definitive book; “Zenith Trans-oceanic: The Royalty Of Radios” by Schiffer Publishing (http://www.schifferbooks.com), spread bands were mandated by Zenith founder Commander McDonald as a solution to the difficulty of tuning shortwave stations on the very crowded SW bands. In a spread band design, a popular SW band segment, such as 31 meters, which covers only a limited frequency range 9.4 tp 10.1 MHz spans an entire band on the dial making it fairly easy to see where you are tuned. On a continuous coverage design like the R-7000, 31 meters is part of SW3 which spans 7.4 to 10.4 MHz, making it much harder to identify specific frequencies between 9.4 to 10.1. The situation was made worse by the fact that when the R-7000 was released, Sony and other manufacturers were already offering radios with digital readouts and direct frequency entry via a keypad which ended once and for all the problem of knowing exactly what frequency you were tuned to. 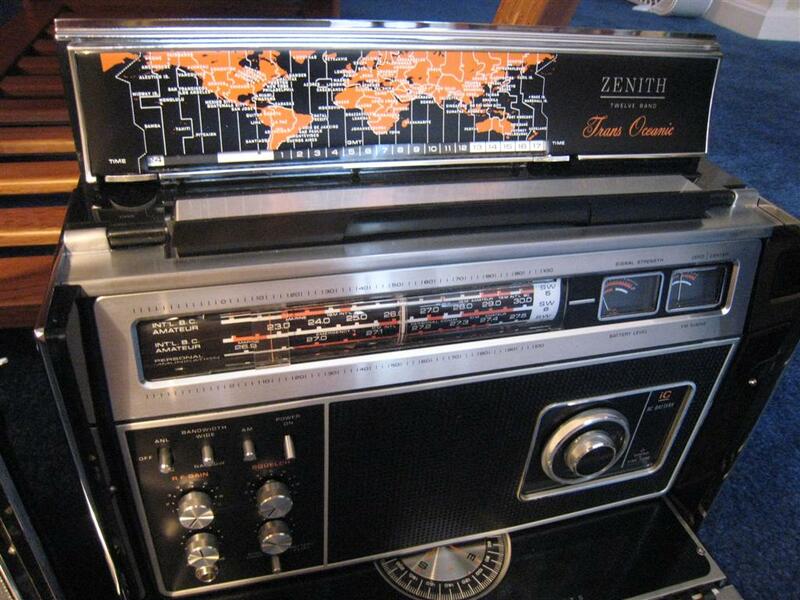 I’m sure that in 1979 – 1981 the Zenith was at a huge disadvantage compared with more up to date digitally tuned radios – it seemed outdated even when initially released, which seems to account for its poor sales. 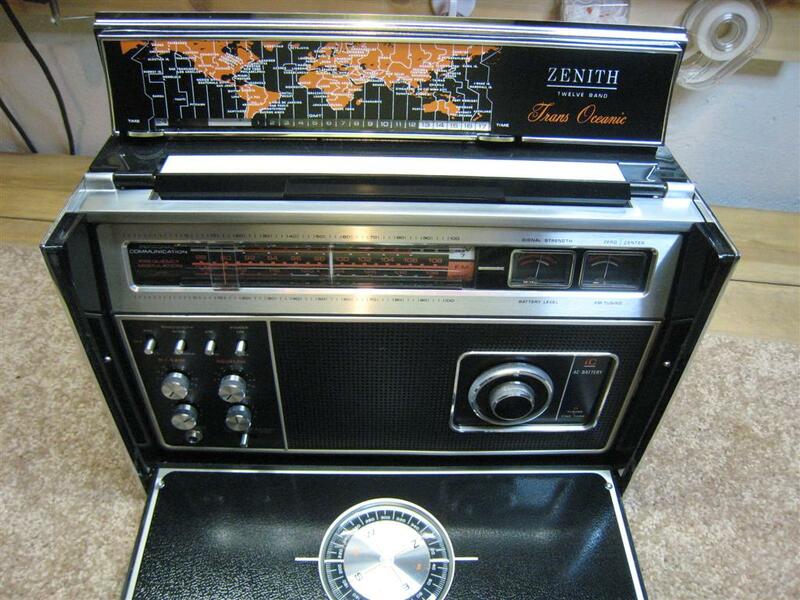 According to Bryant and Cones, at the end of its run they were cleared out of dealers’ inventories for as little as $50…a sad ending for what was once the top of the line flagship product from Zenith. On the positive side, this general coverage design allowed more frequencies to be received outside of the International Shortwave bands, and the inclusion of the two VHF bands allowed coverage of many public service bands. CIRCUIT DESIGN: All previous ZTO’s were single conversion designs using a standard 455 KHz IF for AM and SW and a 10.7 MHz IF for FM. Single conversion designs have one weakness for SW reception in that they may be susceptible to images…false copies of signals appearing where they do not belong on the dial, interfering with desired signals. These images fall at multiples of the IF frequency. The R-7000 employed an innovative approach using the FM’s 10.7 MHz IF for all bands, this effectively eliminating the image problem without the added complexity of going to a dual conversion design. In fact, only one IF string was needed rather than two, so this was indeed a clever approach. THE VARIANTS: There were three versions; R-7000, R-7000-1 and R-7000-2. Differences between the original and the -1 were minor but with the introduction of the R-7000-2 the chassis designation changed from 2WKR70 to 2WMR70 and there was one big improvement; a troublesome belt in the tuning system was replaced by a geared design which eliminated tuning slippage and backlash. Because of this the R-7000-2 with the WMR chassis is the most desirable version. A SPECIAL GIFT: I am not one to spend big money on pricey collector’s items. I tend to buy radios that look nice but need some work so I can restore them, use them, and get a bargain in the process. I just can’t see spending $5000 or even $1000 on a radio simply because it happens to be in its original box…that’s just not me. But everyone has their once-in-a-lifetime big win. For some it may be discovering a diamond in the rough at a tag sale. For me it was through my son and daughter-in-law. Her grandfather had owned a Zenith TV/Radio shop and evidently there were a few items saved when it was closed several years ago. Knowing I love old radios they thought I might be interested in this one which they presented to me as a birthday present…new…in the box…still wrapped in paper and plastic, hang tags attached, cord and earpiece wrapped in plastic, battery tube never opened or used… A NIB (New In Box) R-7000-2. I absolutely couldn’t believe it! A note on that battery tube. Unlike the Royal 7000 with it’s three battery tubes, the R-7000-s was supplied with only one battery tube which is used in the top row of cells. 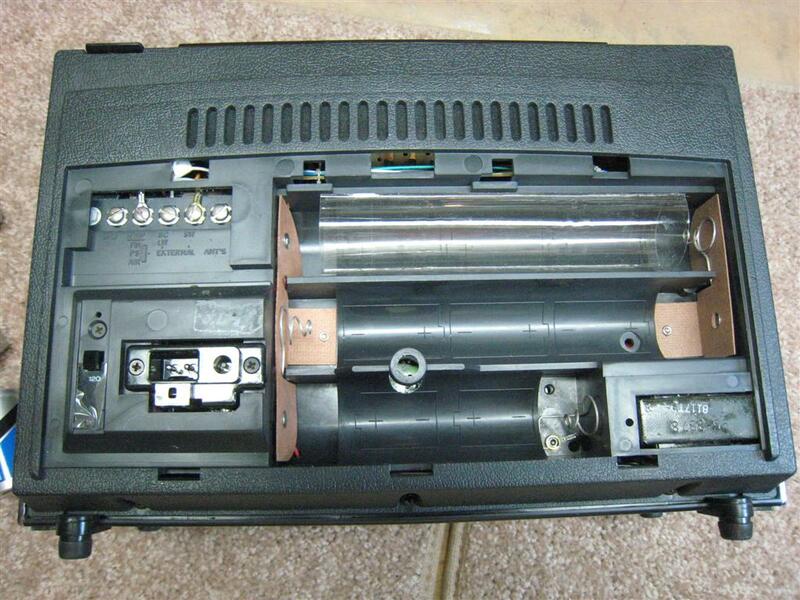 The middle and bottom rows are held in place by the design of the battery compartment itself. Unlike the other semi-rigid battery tubes I’ve seen, this one is soft and flexible, and arrives flattened – it must be held open while the batteries are inserted into it. PERFORMANCE & COMPARISONS WITH ROYAL 7000: The R-7000-2 is an all-around good performer in this class and his nice sound. I compared it with the previous Royal 7000 and found that each had areas of superiority – I consider both very good in this class. I compared the R-7000 against a Royal 7000 and several other reference sets over the course of months and compiled the results. In the end there was no clear winner when comparing these two radios for tough reception conditions. 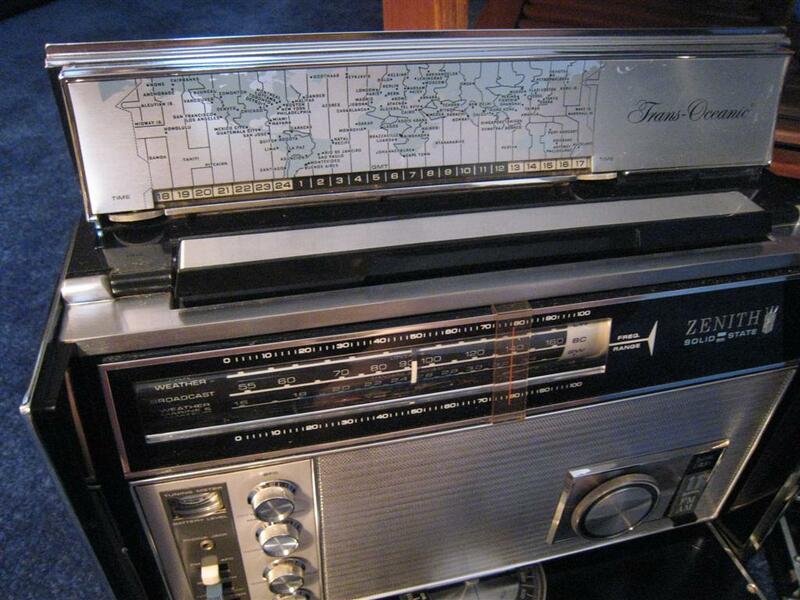 On AM,FM and SW each set had stations that were clearly superior to the other radio and sometimes switching the positions of the radios changed the results…they were that close. I will say the R-7000 is far more sensitive on the VHF bands than the Royal is on its weather band and this experience coincides with the reports of others who have done this comparison. It is also true that while the R-7000 loses the convenience of those 5 spread bands of the previous model, it does add fuller coverage on SW not to mention all the additional VHF frequencies. Each radio has its advantages. A bigger issue is that the R-7000 suffers from a bit of hand-capacitance detuning at higher SW frequencies…starting at about 15 MHz and above. When you let go of the tuning knob the frequency changes a bit, leaving the radio detuned unless you retune it. This varies with frequency and location. For example, when running on AC power this effect is reduced, and (evidently) due the proximity of grounding influences the location of the radio seems to affect this too. I also saw this effect on a unit I borrowed from a friend and it has been noted by many users so it appears to be inherent in the design. The R-7000 has slightly crisper audio on than the earlier Royal model and it’s dial lights work when running on AC without the need for a D cell to be installed as on all earlier T/O’s which run their dial lights on one D cell whether the set is operating on AC or battery power. The R-7000 also adds AIR and PSB bands and has much stronger reception on the NOAH Weather Band frequencies than the earlier model. However the R-7000 does have two Achilles’ heels. On the first two versions (with the WRK chassis) that troublesome belt in the tuning system not only creates sloppy tuning and backlash but is also a replacement part which is hard to find today. And all R-7000’s have a fragile detent mechanism associated with the band selector system…if it breaks the radio will still work but the dial drum will not click into each band as it should…you will have to position it properly each time you change bands. An annoyance and a problem which seems difficult to repair since parts are not available. I suggest you change bands carefully to minimize stress on this delicate mechanism. CONCLUSION: The Zenith R-7000 is somewhat of a contradiction. On one hand it received some negative write-ups because it dispensed with the bandspread design which was the hallmark of all previous T/O’s. It also saw dismal sales numbers due to the lack of a digital readout at a time when that was an exciting feature available from the competition, and it initially had a troublesome tuning belt which was replaced in the final version but probably not until its ill effects were noted in initial reviews, and it has that easy-to-break band-switch detent mechanism. 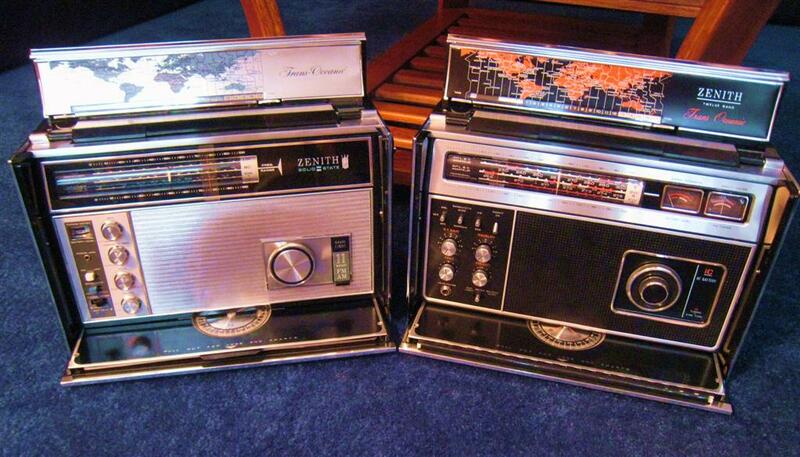 Zenith seemed to have slipped from being an innovator and market leader to a company that was way behind the times. Yet, because of how few units were produced, it is among the relatively rare Trans-oceanic models and as such is among the most expensive of the T/O’s to acquire on the used market. (Also relatively rare and highly sought after are the original 7G605 and the two military models, the R520/URR and R520A/URR). On the positive side the R-7000 does offer some real improvements over the earlier Royal 7000. No images on SW due to the 10.7 MHz IF, slightly better sound quality, expanded and stronger reception on the PSB band which includes the Weather Band plus the addition of the AIR band. Aesthetically it is a beautiful looking radio. Comparing the cosmetics of the R-7000 with the earlier Royal 7000 each has its own appeal…some have described the Royal as having an understated elegance with it black, silver and light blue color scheme while the R-7000 has more visual pop with a bit less silver but lots of black and orange…I won’t take sides on that because I think they are both beautiful looking radios. Royal 7000 vs. R-7000: The way collector’s value radios often has little to do with their performance; it is a combination of rarity, uniqueness, condition and completeness. Ebay has opened the used radio market to a world audience and bidding wars have driven the prices of some collectable items into the stratosphere. Such is the case with the R-7000, especially if it is complete with box and all original materials. If you are a Trans-oceanic lover collector, the R-7000 is a must-have. If you simply want a Trans-oceanic to use you will probably get a better deal on a Royal 7000, whose essential AM/FM/SW performance is quite similar to the R-7000 – better in some ways, less good in others. In terms of serviceability, the Royal series are easier to work on. Because of the high cost of the R-7000 on the used market I never had any intention of buying one, but having one given to me as a gift, it is a radio I enjoy and treasure greatly.